There are two large monuments here with only two family names, Boles and Sawyer. On the tall white bronze monument are the Sawyer family names and the shorter monument are the Boles family names. 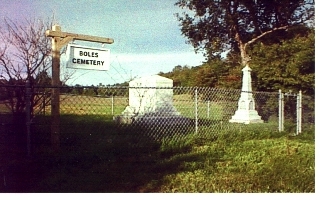 Written on Boles monument are the words “This is the Sawyer farm, the birthplace, scene of all his activities and the last resting place of David Boles”.